Keeping a high regard for our valued patrons, our team of professionals aim at catering to their needs to a level of perfection. A trusted Manufacturer, Supplier and Exporter in nature, our goods have won a great deal of recognition not only in India, but also in various parts across the globe. A highly recommended product provided by our firm is the Tungsten Alloy Brick. 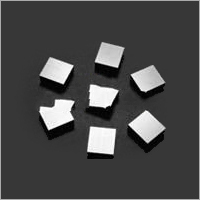 Finding their use in various weighting applications, this is an ideal replacement for lead. The high density coupled with the non-toxic nature makes tungsten an ideal metal for this application. Being completely non-toxic in nature, allows these items to cause zero-degree of harm to the environment. Earning the name of being a reliable company, our goods find their use for military applications, as extrusion die, various counterweights among many more. Thanks to their excellent hardness and superior tensile strength characteristics, makes them a top choice in various industries today. Our offering tungsten alloy brick is always very impressive. Tungsten alloy can be used for military applications, extrusion die, all kinds of counterweights etc. It's appreciable features like high density, high melting point, small volume, high tensile strength, optimum wear resistance, heat resistance, good radiation adsorption capability etc. make it ideal to be used in medical appliances, such as radiation shielding wall, block for CT facility, etc. Tungsten is a naturally neighborly, tough and hard material; its most critical property is its thickness of 19.25g/cm3, which is pretty much the same as thickness of gold (19.3g/cm3). As a result of this likeness, tungsten composite can be utilized as a part of a few applications rather than gold. Gold-plated tungsten amalgam block can be made into decent trinket or blessing. The gold plated block can be given as a blessing to your business accomplices or special and near by clients. It can likewise be utilized as trinket for commemoration, birthday, society action, and so on.